Hansel and Gretel. Cake. Witches. Taylor Swift. This episode had it all. A lot of people know I have a soft spot for episodes that have an “older season feel” to them. As much as I love most of the major story arcs that have gone down, it’s the back to basics, monster of the week episodes that truly bring to light what’s great about this show, that show its strengths, and this episode did exactly that. Dean’s obsessed more than ever with the Mark, his “get rest” motto from last week thrown straight out the window as he drowns himself in the pages of lore books, reluctant to stop, even when Sam finds a case for them and suggests they go check it out. As important as it is for them to find a solution to getting rid of of the Mark, life still goes on, and they still have a job to do. With a little convincing, Dean finally agrees. The witness they speak to claims that aliens are to blame for the the disappearance of a man outside of a bar that left behind a brief flash of light, his clothes, and the smell of flowers. 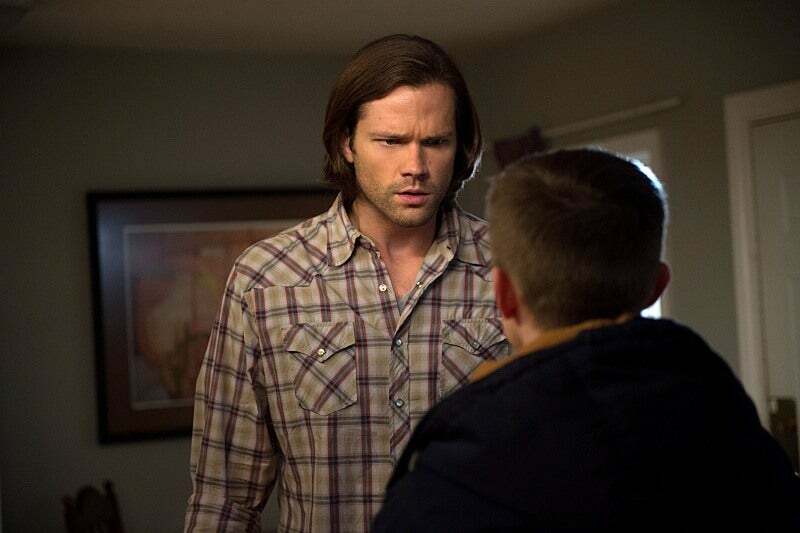 While Sam scopes out the victim’s house, Dean makes himself comfortable at the local bar, chatting it up with a woman named Tina, bonding and drinking over their absent fathers and crappy childhoods. When she leaves, he spots a man following her out, but when Dean goes after them, it’s too late. There’s a flash of bright light, and her clothes lie on a pile in the ground, and soon after, so does Dean’s. When he comes to, he’s locked away in what seems to be a dark room of some kind, possibly a basement, and a dusty old mirror reveals a much, much younger version of himself. He’s suddenly a teenager again, and a moment later, he realizes he’s not alone. On the other side of the wall is Tina and the first victim, J.P., in the same predicament as he is. Once J.P. is dragged out by the strange man that put them all in there, a platter of a slice of cake is pushed underneath each of their doors, and Dean being Dean, immediately starts digging in, stopping only when Tina suggests it’s probably poisoned. He manages to get the window in his side of the room unlocked, and escapes out of it while Tina distracts the man holding them captive, with a silent promise he will come back and save her. Now aware of Dean’s disappearance, Sam investigates out by the dumpsters at the bar, finding Dean’s clothes and shoes strewn about as well as the strange scent of flowers left behind on his pistol. With little else to go on, he returns to the motel. His research mode is interrupted by a knock at the door, surprised and very confused to find his now much younger brother waiting on the other side of it. On the drive back to the house where Tina is still being kept, Sam tells them that a witch is most likely behind this. due to the use of a certain flower used in occult matters, and all they have to do is reverse the spell and Dean will go back to normal. Dean is hesitant, though, revealing the Mark is gone, and that despite it all, it could be better off for him to stay the way he is. Back at the house, they find out that the man there is not only working for a witch, but he is also Hansel, as in Hansel from Hansel and Gretel. The witch has been forcing both of them to kill people for centuries, killing Gretel when they tried to escape. He agrees to help kill the witch, claiming that afterward he will allow Dean to squeeze the hex bag that he wears around his neck that will reverse the spell. However, as they find out when they return upstairs and meet the witch, it’s only a ruse. He willingly worked for the witch all along. She explains that she takes adults that no one will miss and turns them young so that she can eat them. She also mentions that she’s only recently come to the States, a business trip, so to speak, after the Grand Coven asked her to take care of a certain redhead by the name of Rowena who’s been causing trouble. Before the conversation can go any further, Sam manages to get out the pocket knife from his back pocket and attack Hansel. After a struggle, Dean ends up with the hex bag, and after one good squeeze, he’s back to his adult self. He plunges a kitchen knife into Hansel’s chest just before shoving the bag and the witch into the flames of the furnace. With the hex bag gone, Tina can no longer return to her former self, but rather than seeing it as a bad thing, she looks at it as a fresh start, a second chance--- what Sam and Dean both know could have been Dean’s second chance. They consider this a win, though, in the end. Even though the Mark is back, Dean was able to kill Hansel and the witch without “Hulking out.” They both agree they’re going to figure this out, like they always do, and climb into the Impala, riding off to the sound of Taylor Swift’s “Shake It Off,” which might possibly be the greatest ending to any episode of Supernatural ever. “You know, you also believed in the Easter Bunny ‘til you were twelve.” “No I didn’t. Look, I was a eleven.” “And a half.” I really just love references to their childhood. Although we do get some peeks into their past here and there through flashbacks, it’s always great to hear more about the little things they experienced in their own words. I couldn’t get over how perfect the casting is for younger Dean. The mannerisms, the facial expression, just everything about him was completely spot on with the way we all see Dean. Sam’s face when teenage Dean just waltzes into the motel and starts digging through his weapon bag was PRICELESS. “Hey, we got any grenades?” DEAN, NO. Okay but I need to mention the Taylor Swift thing again. Let it all be known that Dean Winchester now listens to Taylor Swift. I really enjoyed this episode! The quotes were crazy.....I re-watched a few things just to watched Sam's face and reactions to young Dean.... who as you pointed out; was Ahhmahzing! I hated to see poor Dean struggling so much with the uncertainty of his ability to control himself. He's always taken the guilt thing to Deafcon1 levels and knowing he could blow up any moment and hurt others has to be gut-wrenching. I do feel the boys seem to be communicating more than usual... which is progress. I was disappointed they didn't get more info from the witch about Rowena; now that she has the blade things will be getting pretty ugly. Sam: “Dude, I’m way too big to fit in that." Teen Dean: “First time you ever had to say that, huh?" Sam: “Big talk coming from the dude wearing Underoos."